In further proof that being a billionaire is pretty great, Russian bigwig Roman Abramovich’s exclusive New Year’s Eve party on the Caribbean island of St. Barts saw Paul McCartney join The Killers onstage for a surprise performance. Fortunately for us normal folk, there’s no shortage of video footage. 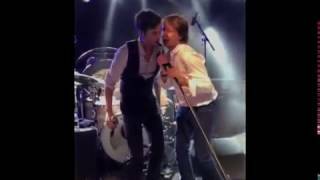 As you’ll see, The Killers’ frontman Brandon Flowers looked downright giddy while shouting out The Beatles’ “Helter Skelter” alongside Macca, who howled with abandon during the unscheduled cameo. This was the 1st and only concert played at Saint-Barthelemy.